Located just minutes from Interstates 85 and 77, Skybrook puts Charlotte within an easy commute and offers an array of lifestyle options for just about everyone. The Town of Huntersville was recently selected #76 by Money Magazine as one of the "Top 100 Places to Live." The resort-style amenities include an 18-hole John Lafoy-designed golf course, swimming pool, tennis courts and much more. The rolling hills and sidewalk-lined streets create a friendly, hometown atmosphere. The Skybrook Golf course features dramatic hills and spectacular views and has the feeling of a true mountain course. The clubhouse has a spacious restaurant, bar, and pro-shop just to mention a few of the features. The Skybrook driving range is one of the largest in North Carolina with 3 expansive tees, a dedicated chipping green and practice bunker to help improve your game. An all purpose field, volleyball court, basketball court and playground. 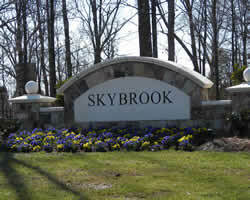 Homes in Skybrook range from the $300s to $800s. Looking for Skybrook homes for sale? Looking for Skybrook homes for sale? Search our local listings database for access to listings in Skybrook and surrounding communities. Whether you want to buy or sell Skybrook real estate, you can browse through properties or find a wide variety of real estate resources available on this website. If you are looking for a REALTOR® for Skybrook, choose Debbie Sloan. As your Skybrook real estate agent, Debbie Sloan can assist you with all of your home buying and selling needs. We can provide you with access to the Lake Norman local listings database and offer our experience and knowledge to make the home buying or selling process easier for you and your family. Contact Debbie Sloan today to get your home search started!